Microsoft released an animated feature called Halo: The Fall of Reach which explores the origins of Master Chief, but does it keep us engaged like the games? Or should they stay away from making films? So something a little bit different this time as we review the Halo: Fall of Reach film. I know absolutely nothing about the franchise other then the term Master Chief, but I also looked at this as a good opportunity to be introduced to it and get a little insight into one of the most popular video game franchises in the world. Halo: The Fall Of Reach takes us back to the beginning and gives us a look at how Master Chief... well becomes Master Chief and the journey he took to get there, I should give a warning now that there could be potential spoilers here, so if you don't want anything ruined for you, watch the film first and come back to check out what we thought. Still here? Great, lets get right into it then. 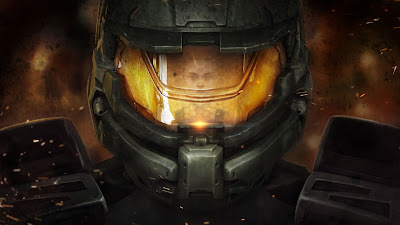 As mentioned earlier, we get a look at Master Chief or John in this case as a young boy who is recruited (or kidnapped to be honest) into the UNSC to take part in the Spartan program, along with other children of similar age due to their superior DNA. They were replaced with flash clones, which died soon after due to the difficulty of cloning an entire human being. Why the program? Why the children? Well apparently there has been an ongoing war going on with a group called the Insurrection and in order to keep up with their growing technological power, this is the solution that the UNSC came up with. We see these kids take part in brutal military training by Chief Petty Officer Franklin Mendez and a life threatening Augmentation program that looks to rebuild their fragile body into one of a super soldier, all in the name of peace... but at what price? This is something we see our characters struggle with constantly in the film, but no more than Dr, Catherine Halsey who was leading the project and soon found herself actually becoming fond of her test subjects. Soon we find out that there is an even bigger threat in the Covenant, a multi race alliance that looks to wipe out all of humanity. Its only hope, a bunch of children that can hopefully exceed all expectations and save us all. Its clear that most of the attention is given to John throughout the entire film and early on it works well during what I see as the first act, however things become a little muddled up later on and I feel that a lot more could have been added to really flesh out the character, especially as he was developing and trying to figure out what he wanted to do as leader. Another aspect which could have been touched on more is the relationships between the Spartan squad members which was briefly looked at in the early parts, but pretty much left out later on. Giving a little more emphasis to the supporting cast I feel could have gone a long way in supporting the main character, especially the friendship between John and Sam. I enjoyed the visual aesthetics they used and for the most part it was a joy to watch. I found it a little unnerving when it went from a close up shot of Dr. Catherine Halsey talking, but soon after backed off and we are presented with pretty much a screenshot for the room the characters are in. Whether this was a time or budget issue, I'm not sure or perhaps that was the style they were going for? Regardless it seemed like a really weird jump and could have been avoided by adding something in that shot that was at least moving. Even the hologram globe in the back would have done it. The entire animation runs just over 1 hour and looking back at it, the amount of lore they were able to add in while still keeping the pacing level makes it a good watch. A few things could have been expanded on and we even see cameo's from other groups such as ODST. Perhaps even 20 mins more could have done this justice, or maybe this is just one of many more Halo features to come? Halo: The Fall Of Reach is a good starting point for those looking to get into the franchise as it can bring them up to speed relatively quickly and I guess the rest of the gaps would be filled by playing the games. For the Halo veteran, there is probably more to be desired, but coming from a newbie it has definitely sparked my interest into taking a deeper look at its universe and exploring more of its lore.